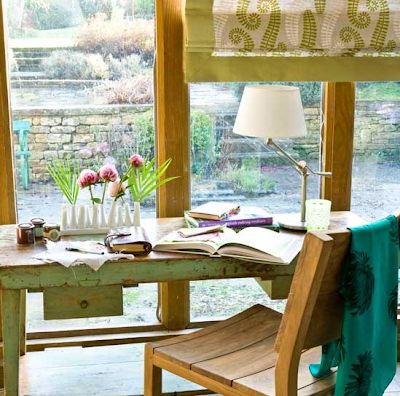 I never tire of looking at creative home offices! I've been working on my little "corner office" in my living room for quite some time and would love to share photos with you once I finish (if I ever finish...). 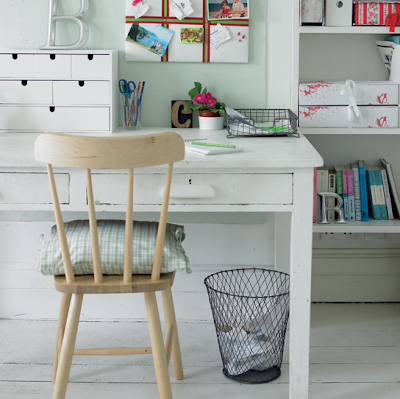 Do you have a home office or creative workspace that you're proud of? If so, I'd love to see photos and include them in an upcoming post! Please email me if you'd like to share. PHOTO CREDITS: HOUSE TO HOME UK & LIVING ETC. But I would like to have a room with a mixture of styles: vintage, a little bit of industrial, a zest of romance maybe and some antiques. Forgot to say: I particularly like that last picture with the old table and the modern Ikea-lamp. But I also definitely would buy that chair in the first picture; great! Beautiful spaces, thanks for sharing....I esp. 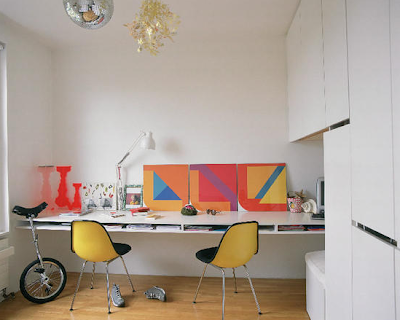 These are wonderful work spaces- so bright and cheerful and inspiring! I can't wait to have enough room so I don't have to share the home office with my husband. I'd love to have a pretty space like one of these to work in. well if you wanna be inspired by mu collages or just dream, come and visit my blog ! I haven't fully set up my work space yet, although I have a desk/computer combo in the living room I use for this purpose. And I love that about some of the photos, that they show people's offices in their living rooms, which is the case quite often. Beautiful and inspirational pix! These photos are fabulous and so inspiring, I too never get tired of taking a peek into other organized spaces-it gives me so much inspiration! I absolutely love all of these...I need to start printing them. I ADORE photo #3. It's perfect. I'll be redoing my work space very soon -- still in the planning stages -- so I very much appreciate having such an abundance of stylish ideas! they are all so inspiring. i really like the space and color palette of the first photo and the whitewashed photo with the empty frame in front of the desk. aren't these little creative spaces our comfort zones really? everyone needs one in their home i think anyway. Oh, these are so inspiring! My home office / office space couldn't compete with these rooms, I'm afraid, even though I'm trying to make it look nice. I think we tend to prioritize other parts of our homes over the office spaces, which is a bit sad - some of us spend a lot of time there. But I'm sure photos like these will make us think differently! Those are really great offices. I wish my creative space were that organized. Instead, it just looks like my office is bullimic - it just throws up all over itself. A girl can dream, though! I cant get enough of these, great selection! These are such inspiring spaces -- especially like the third and sixth -- beautiful! 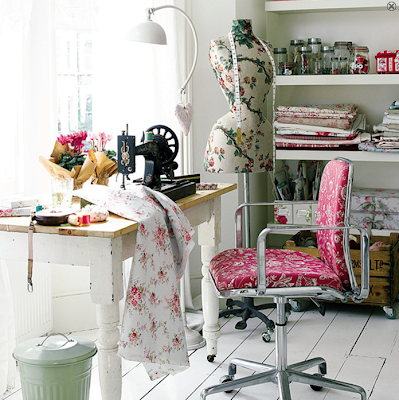 Dream sewing room! Ah, drooling! im going to be re-doing my room soon, so i needed the inspiration. I'm loving all the designs on this post and it's really great to see creative office ideas. I've just done my office out totally shabby chic and it's made working a pleasure from it!